Hurns played four NFL seasons for the Jacksonville Jaguars before joining the Cowboys this season. Dallas Cowboys wide receiver Allen Hurns is taken from the field after injury against the Seattle Seahawks. DALLAS COWBOYS WIDE receiver Allen Hurns was stretchered off the field after suffering a gruesome left leg injury in the first quarter of an NFL playoff game against Seattle last night. Hurns caught a 14-yard pass and was tackled by Seahawks safety Bradley McDougald. McDougald fell on the Dallas receiver, whose leg bent awkwardly, leaving his foot cocked at an unnatural angle as he lay face down on the field. 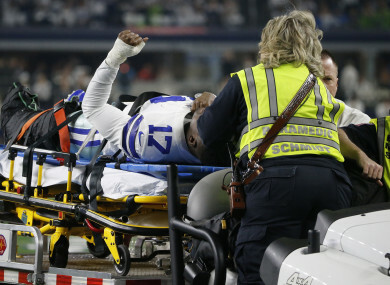 Cowboys teammates and Seahawks rivals watched as he remained on the field for several minutes. Medical personnel put an air cast on his leg and a cart was called out to remove him, with players from both teams talking to him before his exit. Dallas coach Jason Garrett held Hurns’s hand as he was tended to on the field and the player raised his fist to salute cheering fans as he was driven away. Although the coach offered no further details of Hurns’s injury, the Fort Worth Star-Telegram reported that Cowboys owner Jerry Jones told reporters that it was his understanding that Hurns was undergoing surgery for a dislocated ankle and “fractures”. Hurns, a 27-year-old from Miami, played four NFL seasons for the Jacksonville Jaguars before joining the Cowboys this season. He had 20 receptions for 295 yards and two touchdowns for Dallas in 16 regular-season appearances. Email “Cowboys receiver Hurns suffers ugly leg injury in NFL wild card play-off”. Feedback on “Cowboys receiver Hurns suffers ugly leg injury in NFL wild card play-off”.